The War of the Worlds (1953) is one of the 1001 classic movies you should see. This science fiction classic shows a Martian army (the creature in the photo) destroying downtown Los Angeles. Each week, I'm going to recommend a classic movie you should see (for the reasons behind the 1001 series and reviews of earlier films covered go here). Throughout October, I'll be writing about old Hollywood films inspired by English literature. This week's selection is the 1953 adaptation of H.G Wells 1898 science fiction novel, The War of the Worlds. 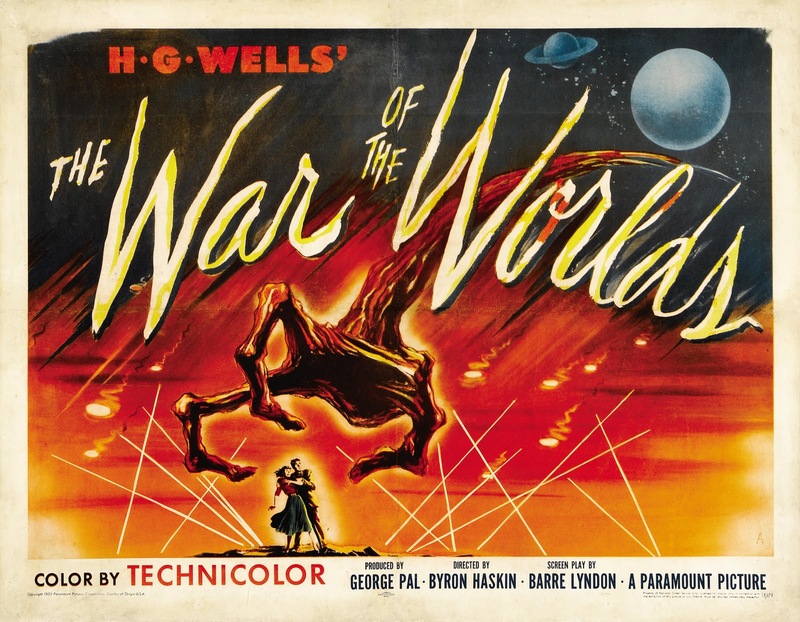 The War of the Worlds tells the story of Dr. Clayton Forrester (Gene Barry), a leading astrophysicist who is vacationing near the rural California town of Linda Rosa when a mysterious meteor lands near the village. Linda Rosa residents want to make the outer-space object into a tourist attraction until an army of menacing aliens emerges from the meteor and begins killing anything and everything in its path. Soon, it is discovered that the aliens are invaders from Mars, and Dr. Forrester is called on by the U.S. Army to help the army battle the otherworldly menace. Producer George Pal had already released two successful science-fiction films, Destination Moon (1950) and When Worlds Collide (1951), when he found old scripts based on Wells' seminal science-fiction novel in a Paramount Pictures filing cabinet. The studio bought the rights to the novel in 1925 for director Cecil B. DeMille, but that project was abandoned because of production costs. From time to time there were talks about filming an adaptation with Alfred Hitchcock or Russian directer Sergei Eisenstein at the helm, but none of those projects ever got off the ground. Finally, special effects maestro Pal turned in a cost-effective and fast-paced film that is still regarded as one of the best fifties sci-fi films. 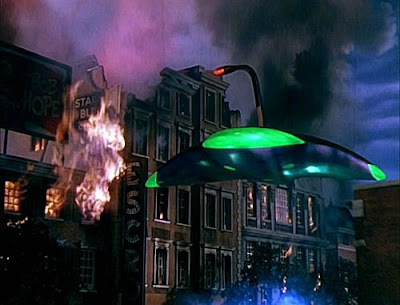 The War of the Worlds uses several passages from the novel for the prologue scenes, and the film follows the general outlines of the book's plot. However, Pal changed the location of the Martian invasion from rural England to Southern California, and rather than have the main character search for his wife, he is a bachelor who finds romance with a comely Linda Rosa local played by Ann Robinson. 1. Martians. The War of the Worlds has a fine cast, but the real stars of the film are the animatronic Martians designed by art director Albert Nozaki. Nozaki wanted to avoid the typical UFO cliches so he designed the Martians to look like manta rays with cobra heads, which gives the aliens a terrifying reptilian presence. 2. Sound Effects. The Martians destructive laser beams were accompanied by a high-pitched, pulsating sound effect that is familiar to Star Trek fans thanks to its frequent use in the sixties TV series. The sound effect is achieved by striking a hammer against a high-tension cable. 3. Role of religion. The secular Wells mostly dismisses religion in his novel, but Pal's film version has strong religious overtones that were grounded in the producer's devout Catholicism. In fact, the memorable final scenes of the movie were shot on location at St. Brendan Catholic Church in Los Angeles. 4. Radio. Moviegoers in the 1950s would have been familiar with Wells' novel because of the infamous 1938 radio broadcast by Orson Welles and the Mercury Theatre on the Air. Pal pays homage to Welles by having Paul Frees play a radio announcer who gives a blow-by-blow account of the Martians' destructive path (clip here). 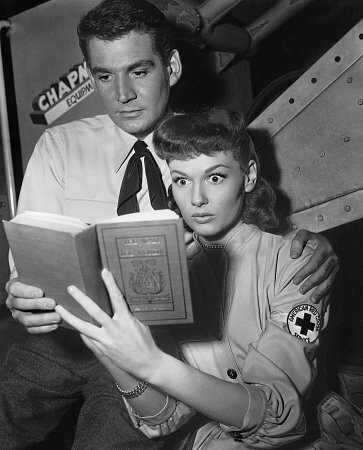 Gene Barry and Ann Robinson read a passage from H.G. Wells' novel on the set of The War of the Worlds (1953). Other critics: The War of the Worlds has an 85 percent fresh rating on Rotten Tomatoes and Leonard Maltin calls the film "vivid, frightening. . .filled with dazzling Oscar-winning special effects" in a 3.5 star review for his Classic Movie Guide. Critics in 1953 found the plot silly but were bowled over by the special effects. The New York Times critic filed a mostly tongue-in-cheek review that urged moviegoers to "[m]ind those heat rays" while heading to their local theater for "an imaginatively conceived, professionally turned adventure, which makes excellent use of Technicolor." The Variety reviewer also praised the special effects, naming The War of the Worlds "a socko science-fiction feature." The Bottom Line: The 1953 film is still the most gripping film version of Wells' classic tale and one of the genuinely great fifties sci-fi films. Availability: On DVD and video on demand. Next week, I'll look at the 1939 adaptation of Arthur Conan Doyle's Sherlock Holmes mystery, The Hound of the Baskervilles. A fun and surprisingly moving movie that I can never turn away from.